When using Mailgun, it’s better to come up with a subdomain (for example, m.customer-success.us), and set it up in Mailgun settings. This will also require you to set up the subdomain in your DNS settings panel. To create a subdomain in Mailgun, add a prefix before your primary domain name in the Mailgun panel. That way, if your primary domain name is “customer-success.us”, add a prefix, such as “m.” (followed by a dot) to your primary domain name. Important: the subdomain address will not be visible to your email recipients. You only use it for Mailgun to be able to set all the required records properly in order to keep your deliverability as high as possible. Before you start using Mailgun to send your emails, it’s crucial to have a properly prepared domain. We recommend using a separate domain for cold outreach, so if you don’t have one yet, set it up. Once your domain is ready for sending emails, you can set it up with your Mailgun account. In the Mailgun “Domains” panel, click “Add New Domain”. Type in the name of your subdomain. As described above, it’s safer to use a subdomain rather than your primary domain address. So let’s say, the name of your domain is customer-success.us. In Mailgun, type in m.customer-success.us – this will be your subdomain for cold emails. Log into your domain management account at your domain registrar. First, establish where your DNS records are being hosted. DNS records are usually hosted by your domain registrar, for example, GoDaddy or Name.com. However, sometimes you can buy a domain from a domain registrar like GoDaddy or any other, but your DNS server is hosted externally by a web hosting company. This step is necessary to allow Mailgun to send emails from your domain on your behalf. It will require you to copy 4 types of records from Mailgun to the DNS settings of your domain: SPF, DKIM, MX and CNAME. The screenshots below come from the panel at Name.com. We use it only as an example here. If you use another domain registrar, you will see a different panel, but look for the same type of settings. DNS setup for your domain should now include Mailgun in the SPF records of your domain. Copy the SPF record from Mailgun and paste it into your DNS records in domain settings. Note: It’s important to make sure the SPF record is set up for both your domain and subdomain. So first, copy the SPF value from Mailgun and paste it into the DNS records of your domain (i.e. customers-success.us). paste the subdomain as Host. paste the SPF record as Answer. Click on “Add record” to save the record for the subdomain (e.g. m.customer-success.us). Copy the DKIM record from Mailgun into your DNS records. It should be the exact same record in both places. If you want to use the Mailgun bounce tracking, you need to set up the MX record only for your subdomain. If you plan on tracking opens, clicks, and including the unsubscribe links in your emails, you need to set up the CNAME record. Important: Woodpecker tracks opens and clicks and it allows you to add the Unsubscribe link to your emails, so if you’d rather use the built-in tools in Woodpecker (which is recommended), you can skip this entire step. In Mailgun, you’ll find two MX records. You need to copy both of them to your DNS settings. Click on “Add record” to save the record for the subdomain (i.e m.customer-success.us). Remember to perform that action for both MX records. Copying just one is not enough. Here’s what it should look like in your DNS server settings. Copy the CNAME record from Mailgun only to your subdomain in DNS settings. First, copy the CNAME value from Mailgun. If you did everything right, you’ll see a green mark next to it. 5.1 Choose your email provider or click ”Other (IMAP)”, and then select the option Advanced - I want to use another SMTP server. 5.2 Fill out IMAP server data. Note: this will be empty only if you chose “Other” in the dropdown list. If you’re using a default IMAP from Google, Office 365, or Exchange, these will be set to their respective default for you. 5.3 Connect your SMTP from Mailgun. In the SMTP Server data section in Woodpecker, choose Mailgun from the dropdown list of SMTP providers, like in the screenshot below. First, copy the API Base URL from Mailgun, and paste it in Woodpecker into the API Domain field. 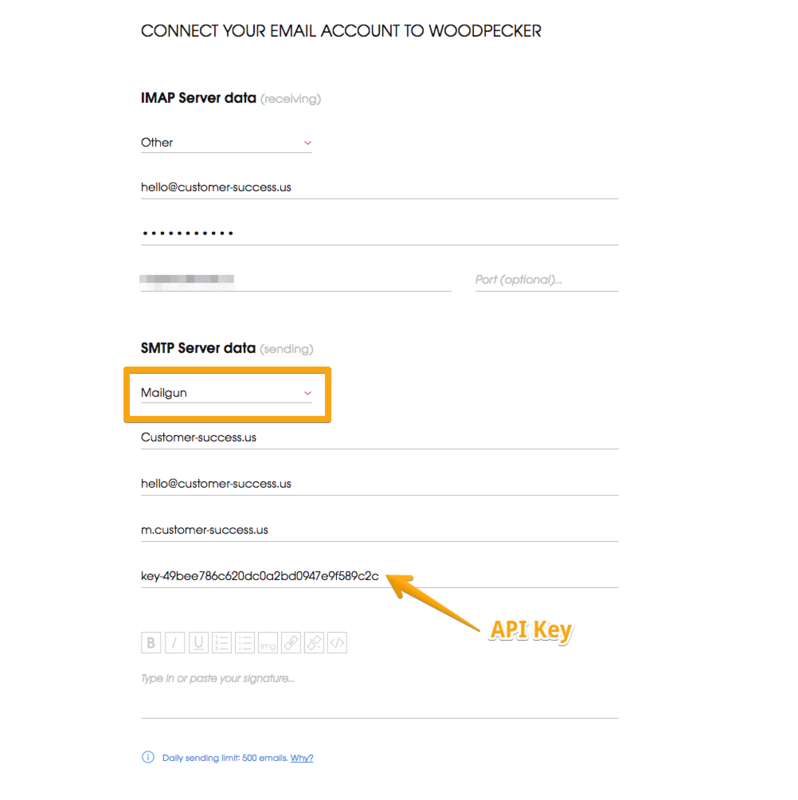 Second, copy the API key from Mailgun, and paste it in Woodpecker into the API Key field. There you go! You’ve just connected your email account with Mailgun SMTP to Woodpecker. To test the SMTP connection, create a campaign in Woodpecker, add at least one email address as your prospect, and click “Save & Send” to send a test email to this address.